Heat oven to 350ºF. Spray 8-inch square (2-quart) glass baking dish with nonstick cooking spray. To potatoes, add whipping cream, 2 tablespoons butter, the maple syrup and salt. Mash with potato masher or electric mixer until smooth. Spoon into baking dish. In small bowl, mix crushed granola bars and 2 tablespoons melted butter; sprinkle over potatoes. Bake uncovered 25 to 30 minutes or until thoroughly heated and topping is crisp. Do-Ahead: Make this rich casserole up to 8 hours ahead of time, but sprinkle with the granola bar mixture just before baking. 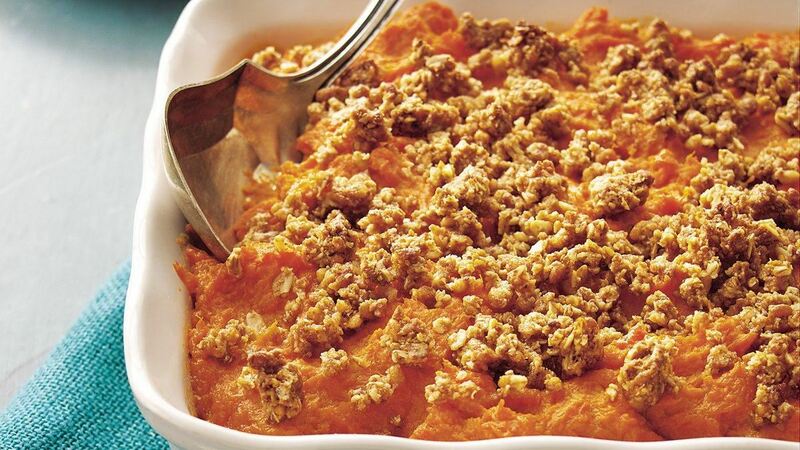 Success Hint: For the prettiest dish with the best flavor, use dark-orange or red sweet potatoes in this recipe.